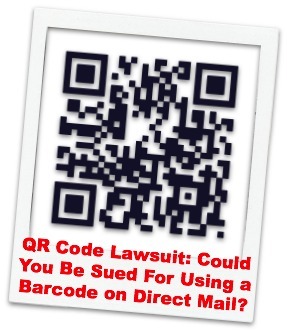 A few days ago, I learned from an industry source that a group calling themselves “Secured Mail Solutions” is filing lawsuits against a number of high-profile companies claiming infringement on two patents related to QR codes. At MindFire, a number of our Clients utilize QR codes within their multi-channel marketing automation workflows, so my interest was piqued. The lawsuit includes some fairly well-known companies like RR Donnelley, Harte-Hanks, Microdynamics, Vertis and others. It was explained to me that these patents both pertain to the use of a barcode on direct mail, where the barcode is linked to a database for purposes of tracking. This description seems to include QR codes, as well as POSTNET barcodes. Please note that I have not had time to personally investigate these claims — nor seek legal counsel — so don’t take my post as a statement of fact, nor any official position from our company. I’m merely musing on what I’ve heard. Secured Mail Solutions appears to be a company that owns the patents that are being enforced; you can see more here: http://securedmailsolutions.com/Intellectual_Property.html. If the lawsuits have merit, it could be somewhat disruptive for the industry, since there’s so much hoopla about using QR codes in marketing campaigns. It also seems like this lawsuit would eventually have to involve the US Postal Service, since they now require the use of barcodes. • 7,814,032: “System and method for mail verification” by Fitzsimmons.. Includes 22 claims (2 indep.). Was application 11/519,739. Filed 9/11/2006 & Granted 10/12/2010. • 7,818,268: “System and method for mail verification” by Fitzsimmons.. Includes 56 claims (3 indep.). Was application 10/271,471. Filed 10/15/2002 & Granted 10/19/2010. What do you think? If you have time to look into this, leave me your thoughts in the comments. As soon as I have more information, I’ll post an update.